The ministries of agriculture of Cuba and the Republic of Mozambique today signed a cooperation agreement in this capital with the purpose of developing bilateral ties in this area, as well as food security and agricultural research. 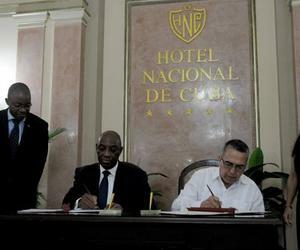 José Miguel Rodríguez, Cuban Deputy Minister of Agriculture, and his counterpart Luísa Caetano, who is part of the delegation that accompanies the president of that nation, Filipe Jacinto Nyusi, signed the document. During the event it was known that the agreement aims to define the basis of the institutional relationship between both agencies, with a view to fostering links in this branch of the economy. On this day, the two countries also signed an agreement on reciprocal exemption from the lease payment of the property delivered by each of the parties for the operation of their diplomatic missions and official residences in their respective territories. This document was signed by Marcelino Medina, Interim Minister of Foreign Affairs of Cuba, and Oldemiro Júlio Marques, Minister of Foreign Affairs and Cooperation of Mozambique. Both countries signed a cooperation agreement between their ministries of education last May to share experiences in education to strengthen training and education in the public education system. As scheduled, President Nyusi will hold talks today with Army General Raúl Castro, President of the Cuban Councils of State and Ministers. Strengthening collaboration in key sectors such as health, agriculture, technical and vocational training, culture and tourism stand out among the interests of the bilateral agenda, diplomatic sources announced. The peoples, parties and governments of Cuba and Mozambique have been together for more than four decades with strong ties of cooperation and friendship.